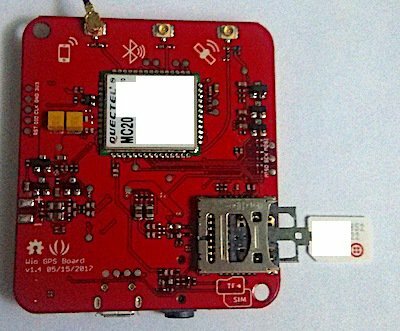 Using these instructions and the affordable Wio Tracker GSM from Seeed Studio, you can quickly get connected to the internet with Twilio's Programmable Wireless. In this quickstart, we'll use the Arduino IDE to program our board. However, the modifications we make should be adaptable outside of the Arduino ecosystem. While most of your code will be transferrable, it’s important to note: for new product development in the United States 2G isn’t a good choice. American 2G networks are being deprecated. For new development, we suggest researching alternatives or discussing your idea with the Twilio Programmable Wireless team. 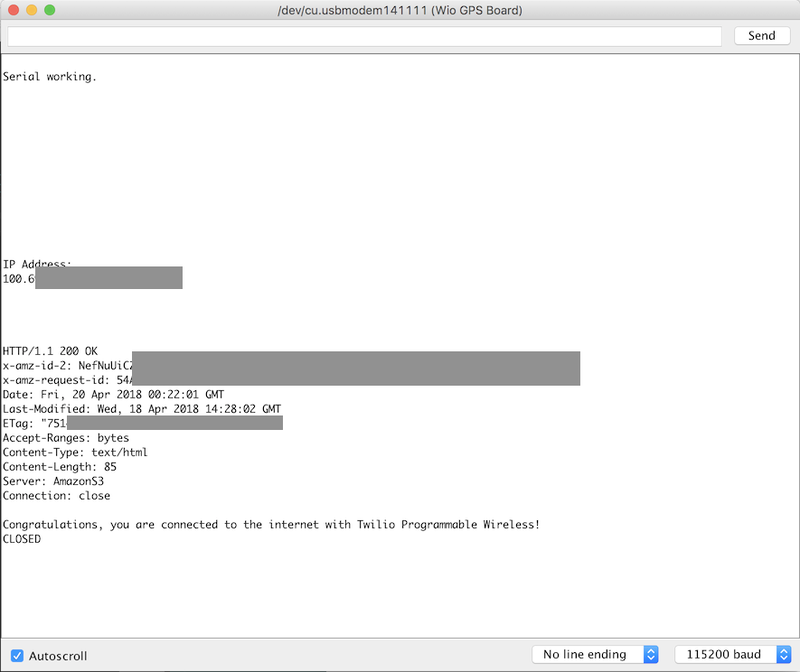 Before you can connect with Twilio Programmable Wireless you'll need to sign up for a Twilio account. Once you've done that, continue this quickstart. Visit the Programmable Wireless Console. On the Orders page, purchase a set of 3 starter SIMs or make a larger custom order. Once you receive your SIM shipment, choose one and remove it from any packaging. Once removed, visit the Register a SIM page in the Wireless Console. By default, there are rate plans added which approximate the usage we see in the field. Rate Plans let you control every aspect of what your device can do in the field and their data usage, but their complete capabilities are beyond the scope of this post. When you're happy with the naming and rate plan, click to 'Activate' the SIM card. I'm active! Let's grab the Wio. Punch out your Twilio SIM card if necessary and insert it into the slot closest to the PCB on the Wio. The slot is on the modem side and has an orientation diagram. You want to put it in the 'bottom' slot; the upper slot is for an optional MicroSD card. If you have a 3.7v Lithium Ion battery with the proper connector, connect it to the Wio Tracker. Although the Tracker will run without a battery, brief spikes of power consumption may make the Tracker unreliable or cause a freeze. It is highly recommended you add a battery to your setup for reliability. Now that everything is inserted and connected you're ready to power it up and flash it! Follow these steps to get serial connected on the board. Open the Arduino IDE if it isn't yet open. 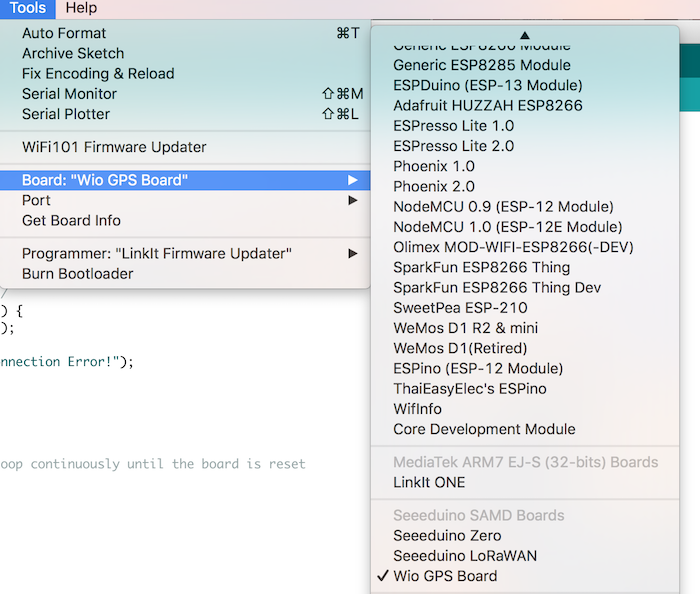 In the 'Tools' menu under 'Boards', scroll to 'Seeduino SAMD Boards' and select the 'Wio GPS Board'. A new serial port should be enumerated in the menu. Visit 'Tools' -> 'Port', then select the Wio Tracker's serial. If everything is set up properly, now you're ready to add the firmware to the board. Create a new project and paste the following code, or download it from Github and open it in the Arduino IDE. 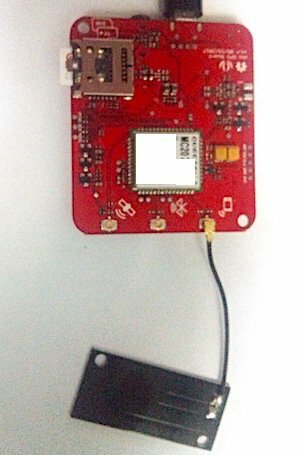 Connect to Twilio Programmable Wireless with the Seeed Studio Wio Tracker and GPRS. Once you have the code inside the IDE, 'Upload' the code to the board. Open the serial monitor by visiting the 'Tools' menu, then selecting 'Serial Monitor'. And there you have it! Internet connectivity with the Wio Tracker and Twilio Programmable Wireless.